Lake Reality is a private, “Members Only” lake owned and operated by the LAKE REALITY HOMEOWNERS ASSOCIATION. 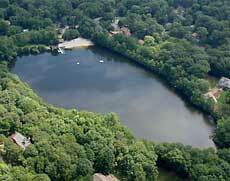 Associate membership is available to Kinnelon, NJ residents who do not reside in the Lake Reality neighborhood. Associate membership is available on a limited basis and total lake membership consists of approximately 90 member families per year. Enjoy a full range of summer lake activities: protected swimming daily during the summer season, swimming lessons, family picnics, holiday parties, fishing and boating, winter ice skating and ice fishing. Click on photo to view Larger size. To purchase photo click on Lake Store. Got something on your mind! Spill!